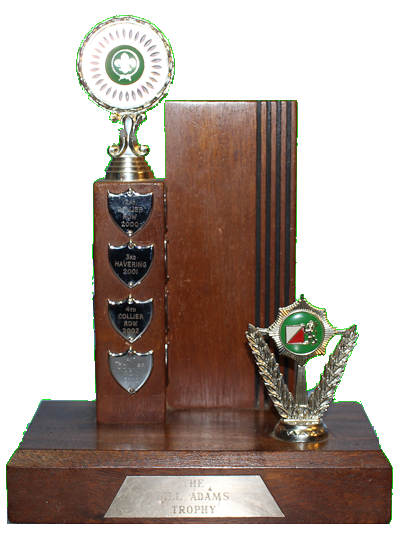 The Bill Adams Trophy is presented to the Scout Patroal that wins the District Orionteering competition. The trophy was contested 25 times between 1982 and 2006. In 2005 the Romford Event was combined with a county event and the Bill Adams Trophy was presented to the top team from Romford which happened to be the 2nd placed team from GLNE. In 2006 the orienteering competition was run as the second day of the Barton Challenge Event however it was open to teams that didn't take part in the full Barton Challenge. In 2007 neither the Barton Challenge or the Orienteering took place and the Orienteering event didn't restart until 2010 when it continued in its original format as its own event.